Free Printable Weekly Time Sheet. Free Printable Weekly Time Sheet for business or employer use in PDF format. Very useful form where employees can log the hours worked each week. Print this printable Weekly Time Sheet free using your laser or inkjet printer. You can log information like in and out time, regular hours, overtime hours, week ending, signature, authorization signature and more. You can open and print this free printable weekly time sheet with free pdf adobe reader. Save money to your business by printing all the time sheets you need free. 1 Weekly Time Sheet per page. 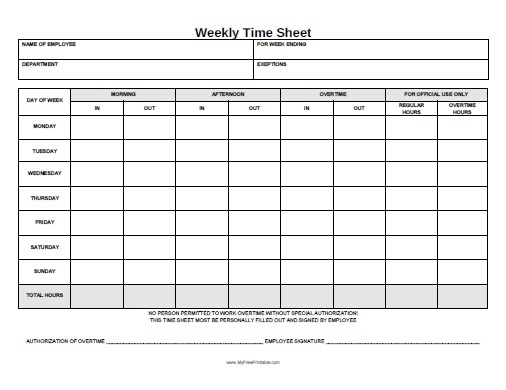 Click the link to download and print the Weekly Time Sheet template free in PDF format.